VLC is by far the most popular and the best audio and video playback program for Windows, Linux and Mac users. It has much more features than any average user would ever use, one of which is its video conversion capabilities. 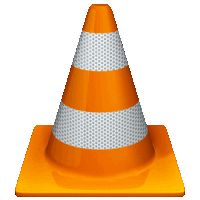 VLC coverts to and from almost every popular media format today and you can even perform video to audio conversion with VLC. Most of us buy very costly programs just to convert videos from one format to another, but why not use the best video player that you use every time for your video playback. I have seen many people switching to VLC as their media player of choice just because of this feature in VLC. Moreover, other programs cost you huge bucks, whereas VLC is providing all those features for free. Start VLC player and go to “Media” tab in the top navigation menu and then select “Convert/Save” option. You can alternatively press the key combination Ctrl + R from the main screen. 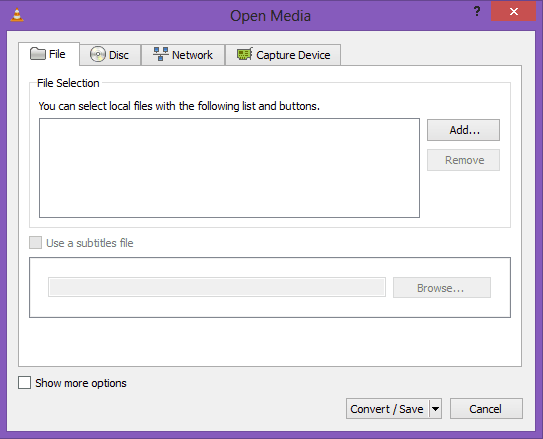 Now an “Open Media” box will popup which will allow you to add and convert videos using VLC. Just click the “Add…” button and select the video you want to convert from the file browser. You can also tick the “Show more options” at the bottom of the popup, which will show you some advanced options, which are not required in most of the cases and to most of the users. You can also add a subtitles file which will be added to the video during conversion. After selecting the file click on “Convert/Save” option. 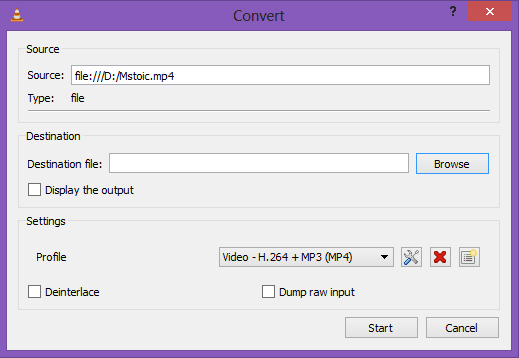 Now this will bring a popup box in which you can select the output destination where the converted file will be saved. You can also choose the profile in which the file will be converted. VLC has tons of preset profiles and you can configure them according to you and also add your own presets too. Clicking on the new profile button allows you to define a new profile and change the Encapsulation (Format), the Video Codec, the Audio Codec and some settings for the Subtitles for the new profile. For people searching for highly customized conversions, the custom profile feature would suffice. After doing all the configurations press the “Start” button and VLC will convert your video in the main application window itself. VLC will also show you the progress in its usual progress bar and will play your video as it converts it. NOTE It seems like you cannot convert multiple videos to multiple files simultaneously with VLC. This is not a big issue if you need to convert a single or two files at a time. VLC as we all know is the best media player for playing video files. But most of us are unaware that VLC can be used as a video converter as well. If you use VLC player then you must say “no” to all those video conversion programs that cost you huge bucks and stick to VLC for converting videos. Thanks guys…wel get in contact.. N get more of ua services..
thanks, Man. 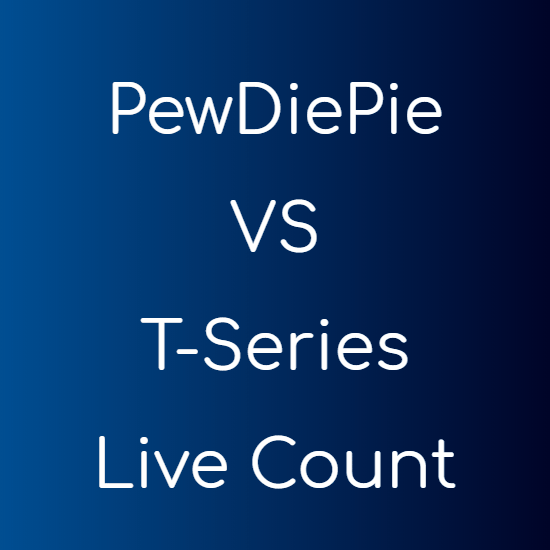 I Really like this Content.